Inter war the custom had been introduced of Warrant Officers and N.C.O.s wearing badges of rank of Black on a Red background similar to the Kings Royal Rifle Corps. This custom continued throughout the war and beyond. A Black lanyard/whistle cord was worn by Officers and Warrant Officers on the Left shoulder. Blackened Brass shoulder titles were worn consisting of T over BUCKS although these were worn, withdrawn and worn again but the war diary says they were also unobtainable along with cap badges whilst in France so not everyone would have worn them. 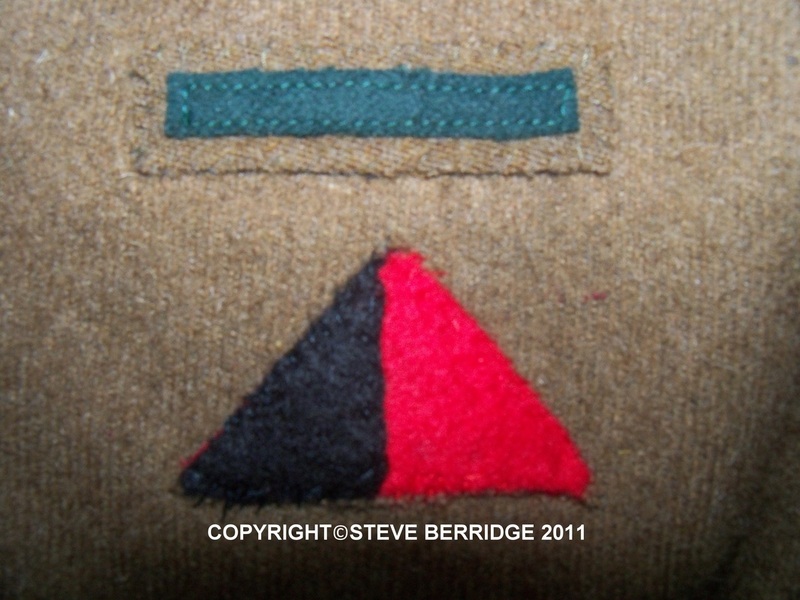 A regimental shoulder flash was adopted in 1940 in the form of a triangle in the county colours of Red and Black. 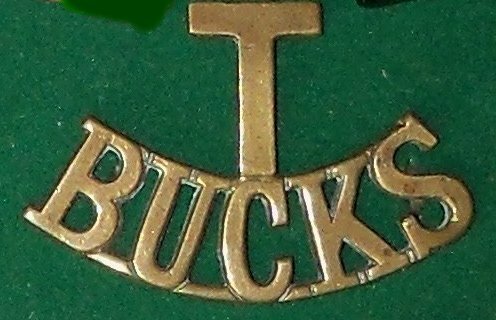 This only appears to have been worn by the 1st Bucks. (1) 1400 Regimental Shoulder Flashes have been received and will be issued proportionally to Companies. They will be issued in pairs and sewn one to each sleeve of the battle Dress blouse with the right angle uppermost and 1 ½ inches from the centre seam of the base of the shoulder strap. Care will be taken that the longest side is horizontal. (2) Future Flashes will be received in due course in sufficient numbers to equip the entire Battalion. 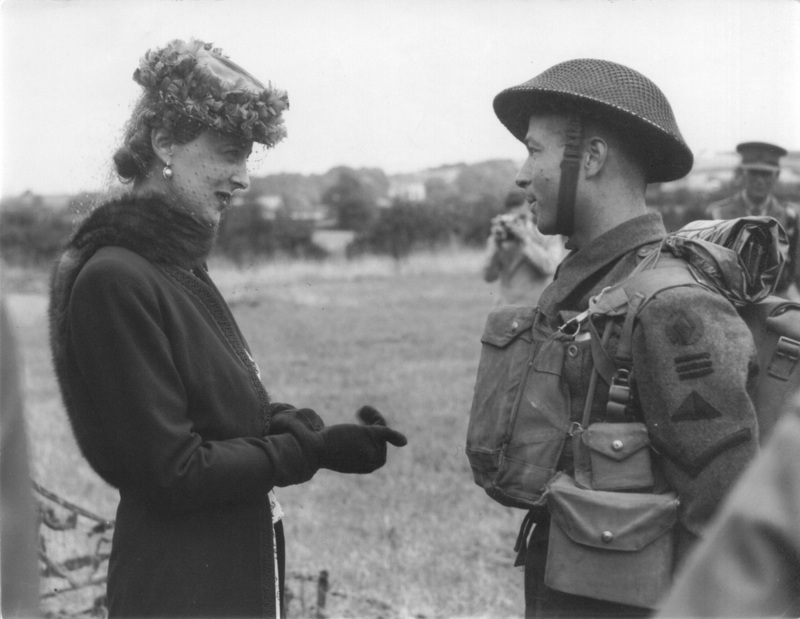 ACI (Army Council Instruction) 1118 of 1940 laid down that to distinguish between services of the army that an “Arm of Service” strip was to be worn by all ranks on battledress and the greatcoat. When I received your letter of 8th March with reference to the Bucks Battalion I at once took up the matter, I am glad to tell you that the Central Ordnance Depot, Branston, have been informed that the battalion is a Rifle Battalion and should be issued with rifle green stripes. The battalion had got its Green Strips! 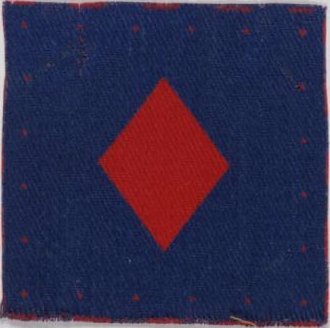 Divisional Signs were reintroduced early in 1940, but instructions were given in December of the following year for them to be described as 'Formation Badges'………..
……………Infantry battal­ions wore one, two or three red (or green) strips one below the other to indicate the brigade to which they belonged…………. join the B.E.F. in January 1940, and took part in the operations in France and Belgium until the evacuation from Dunkirk in May 1940. The 48th Division did not serve overseas again as a formation. For the remainder of the war it formed part of Home Forces, filling, in the later years, the role of a training formation, which was adopted in 1942. Cambridgeshire, Herts and Essex. The formation did not serve overseas as a Division, although it was absorbed into the Lines of Communication of 21st Army Group. 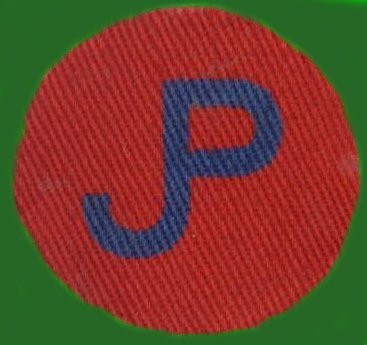 The Divisional badge was a small red circle, the monogram 'JP' in blue in the centre. These were the initials of the Divisional Commander (Major-General J.H.T. Priestman, C.B.E. D.S.O., M.C.). One brigade of the formation (the 162nd) remained as an independent infantry brigade within 21st Army Group and retained the former Divisional sign as their badge'. 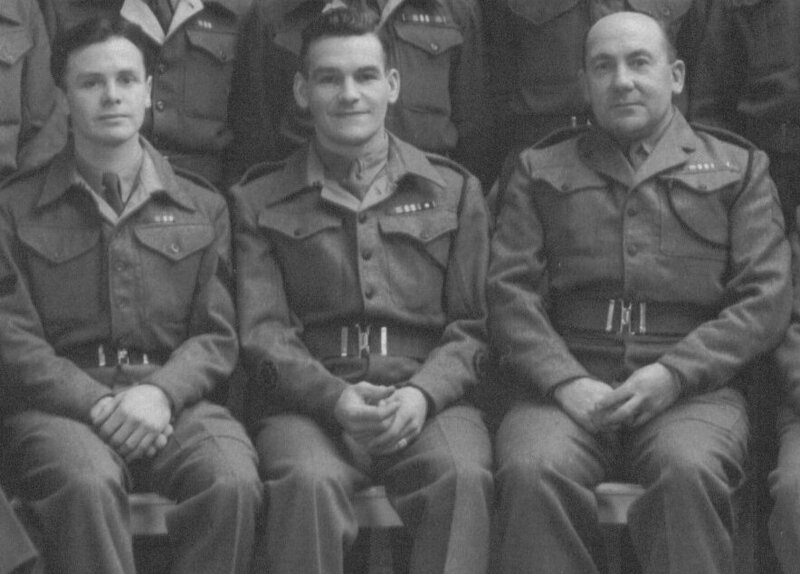 "The 3rd British Division was anxious that the battalion and group should feel part of the division and authority was given on the 28th November 1943 or all to wear the divisional flash. This was worn until shortly before the invasion, when a special beach group flash (a red anchor on a pale-blue field) was introduced." 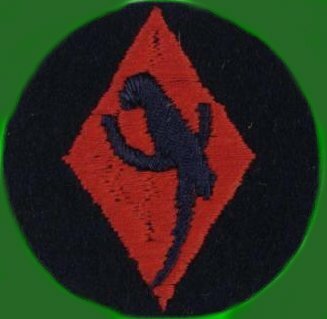 Another Regular Army division which served with the B.E.F. and took part in the heavy fighting in holding the Dunkirk perimeter during the evacuation in May 1940. The Assault Division of Second Army, the 3rd Division landed on the Normandy beaches on the Gth of June 1944. As part of 1 Corps it took part in the establishment of and the subsequent break out of the beachhead and the operations in North-Wcstcrn Europe culminating in V.E. Day in May 1945. In the autumn of that year the Division was withdrawn from the British Army of the Rhine arid embarked for the Middle East. 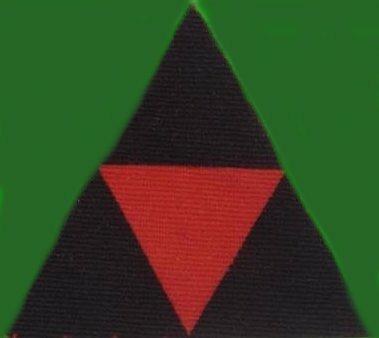 3rd Division's badge was a red triangle surrounded by three black ones, the whole forming an equilateral triangle. 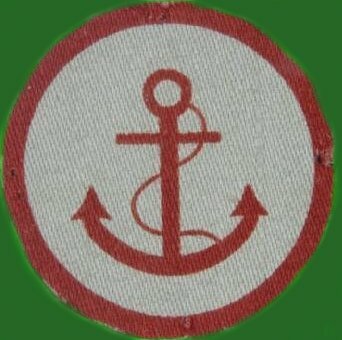 The fouled anchor in red on a pale blue background within a red circle was the badge of the Beach Groups. These groups were composed of specialist units of the Army, Navy, and R.A.K. formed in a complete amphibious formation. The naval element was made up of R.N. Signals and R.N. Commandos; the R.A.F. provided a balloon barrage section for the defence of the beaches and specialists who prepared the way for the R.A. F.'s airstrips; the Army provided an infantry battalion for the seizing of the beach and the defence of the beachhead perimeter, Royal Engineer Field Companies, Mechanical F.quipment Platoons, a Stores Section and Transportation units, R.A.S.C. general transport companies with D.U.K.W. 's, a D.I.D. and Petrol supply unit, an R.A.M.C. unit, C.M.P. traffic control, and an R.E.M.E. Recovery Section and Pioneer Companies. Beach groups first operated in the landings in Sicily. On 6th June 1944, D Day, on the Normandy beaches beach-group troops landed with the assault troops and distinguished themselves in the establishment and maintenance of the beachhead. Headquarters Lines of Communications 21st Army Group. H.Q. Lines of Communication 21st Army Group and the L. of C. and Base Sub-Area H.Qs. 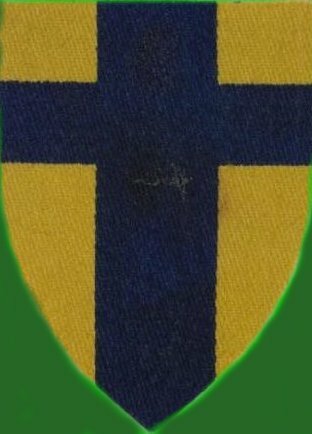 This was a dark blue crusader's cross on a yellow shield and was worn by all ranks, and stencilled on the vehicles of the H.Qs. of the L. of C. and certain formations and units under direct command of those Headquarters—i.e., Chief Engineers (Works) and Cs.R.E. (Works), etc. H.Q. British Troops in the Low Countries. Formerly H.Q. lines of communication 2lst Army Group, this Headquarters continued to wear its former badge; a dark blue cross on a yellow shield. With its Headquarters in Brussels it was the Administrative H.Q. for all British troops located in Belgium and Holland after the cessation of hostilities in North-Western Europe. 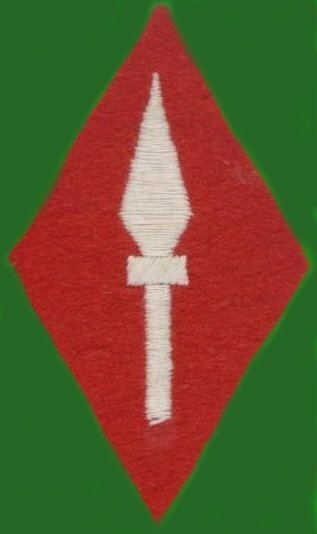 A white spearhead on a scarlet diamond was the badge of 1 Corps; The design of the badge was adopted because in pre­war days the 1st Corps at Aldershot was the only British Corps permanently in existence, and as such was the spearhead of the British Expeditionary Force, as it had been in 1914, and was indeed again in 1939. 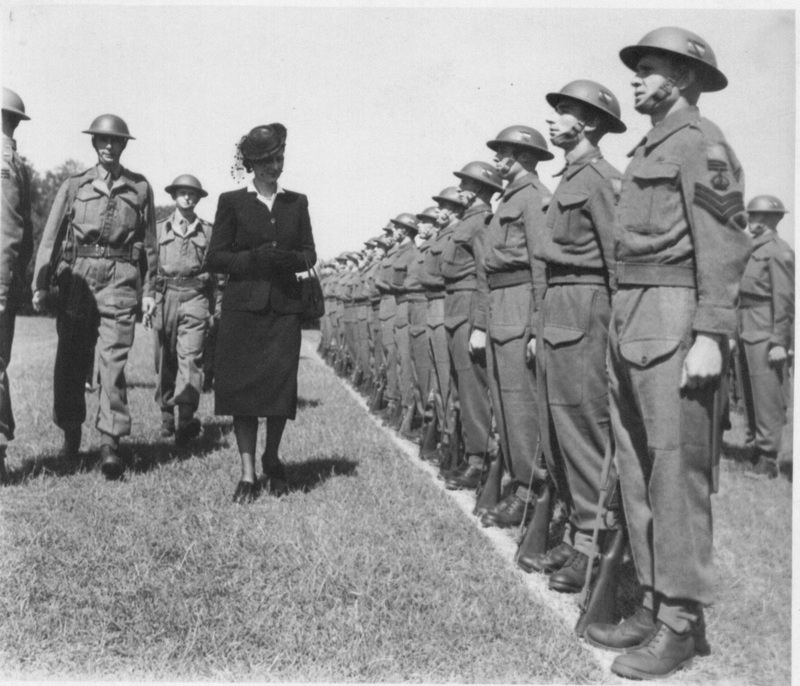 The Corps formed part of the B.E.F., going abroad in September 1939, to France. It was among the formations withdrawn from Dunkirk in May 1940. The Corps badge was adopted whilst the formation was part of the B.E.F., and was symbolic of the selection of this Corps as an assault formation. 1 Corps landed in Normandy on D Day, 6th June 1944, and fought across France, Belgium and Southern Holland. The formation formed the first static district of occupied Germany, (1st Corps District) taking over the control and administration of the Rhine Province and Westphalia in the final stages of the campaign. This was the duplicate (second-line) Territorial Army Division of the 48th (South Midland) Division. Raised in 1939 to 1945, it formed part of Home Forces. Its badge was a red diamond on a blue background. The Division moved to Northern Ireland in July 1940, being distributed over the counties of Londonderry and Antrim. It later moved to Armagh, Tyrone and Fermanagh. 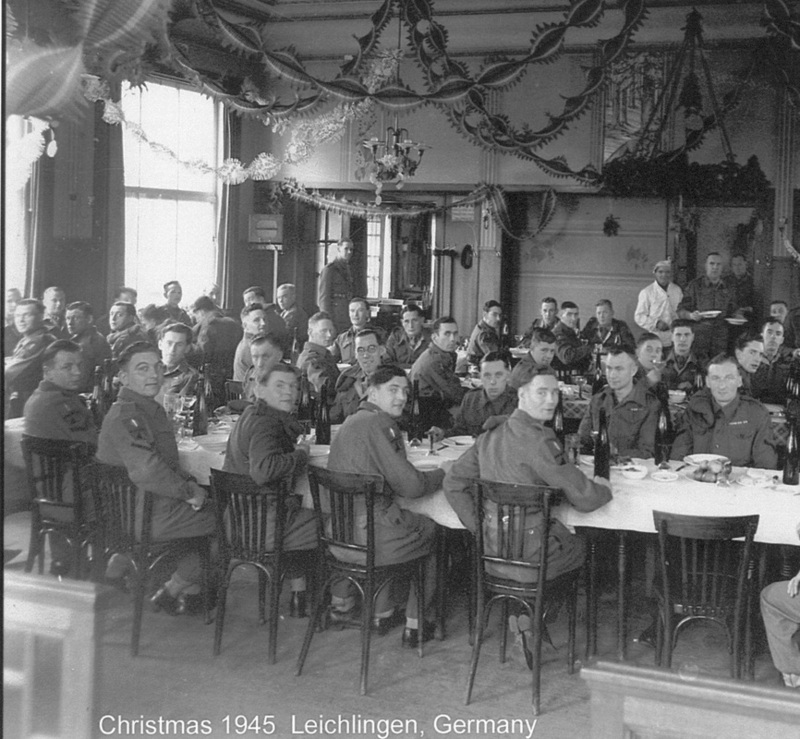 It returned to England in 1943 was mobilized for service in North-Western Europe, but it was subsequently stood down and became a training and drafting Division in Home Forces.